Delta Faucet is a world leader in the making of faucets and related products. Inspired by exposed hardware and traditional design, the Broderick™ Kitchen Collection is styled after the rugged nuts and bolts of machinery, serving as a true centerpiece in the kitchen. The collection appeals to homeowners in search of high-end style for the kitchen that reflects traditional design with an industrial twist. 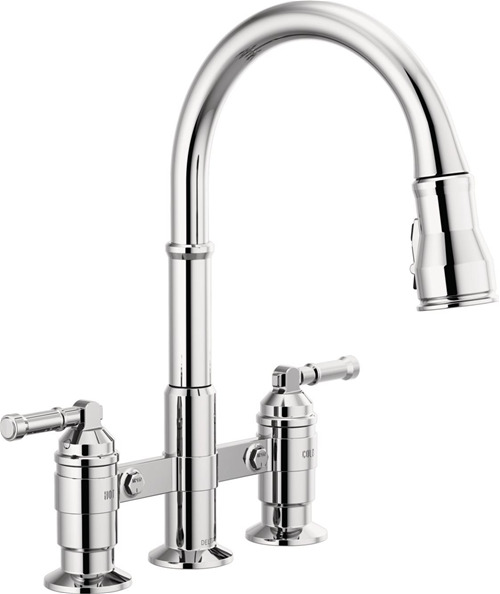 Asserting a powerful presence, the collection includes distinctive bridge faucet and pull-down spring spout faucet options that add a unique element to any kitchen. Available in Chrome, Arctic® Stainless, Black Stainless, Champagne Bronze™ and Venetian Bronze™ finishes, the suite includes pull-down kitchen and bar/prep faucets, a pull-down spring spout kitchen faucet, a two-handle pull-down bridge kitchen faucet, a bar faucet, a wall-mounted pot filler and a coordinating soap dispenser.